Items can be checked off your list as they’re purchased with a tap, and restored for next time the same way. Although my wife loves to browse on her iPhone and iPad, she’s old-fashioned when it comes to shopping. Planning weekly meals or making a grocery list is all about pen and paper, no matter how much I try to infuse software into the mix. But her traditional ways may not be long for this world. 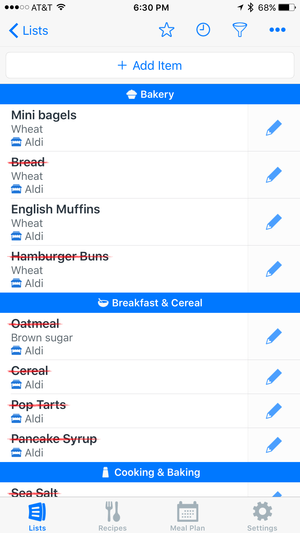 AnyList is a free, universal grocery shopping app offering a built-in database of items for creating multiple lists. Start typing the name of an item, and the app autocompletes each entry to speed up the process. You can even add items by voice with Siri, thanks to a clever feature that checks Reminders for new items at launch, then removes them once imported. Once an item is in your cart, tap to cross it off the list; another tap restores it for next time. Added items are automatically separated into categories, but can be manually sorted into custom groups. You can mark items as favorites, move or copy between lists, and assign color themes. 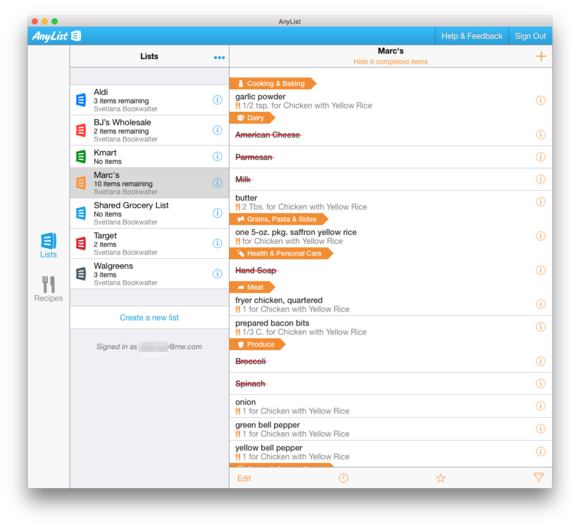 AnyList also stores entire recipes, either manually entered or copied and pasted from websites or email. With a single tap, all required ingredients are added to a shopping list, or the complete recipe can be printed or shared via email. 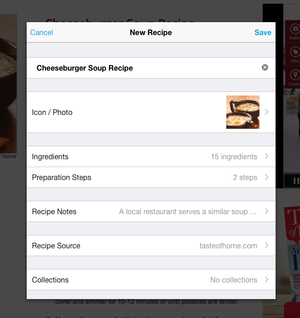 AnyList is also a depository for all your favorite recipes, and ingredients can be added to a shopping list in one tap. Recipes and individual lists can be shared with others, such as your spouse, roommates, or the entire family. All that’s required is an email address, used to sign up for a free account. Everything is securely backed up in the cloud, with freaky fast sync between devices. While the free version offers an impressive array of features, a paid subscription ($8 for a single user or $12 for a family per year) really makes AnyList boil. For starters, paid users are able to access accounts from any web browser, or use companion native applications for Mac and Windows. Subscribing also adds browser extension support for automatically importing recipes from popular websites with a click. 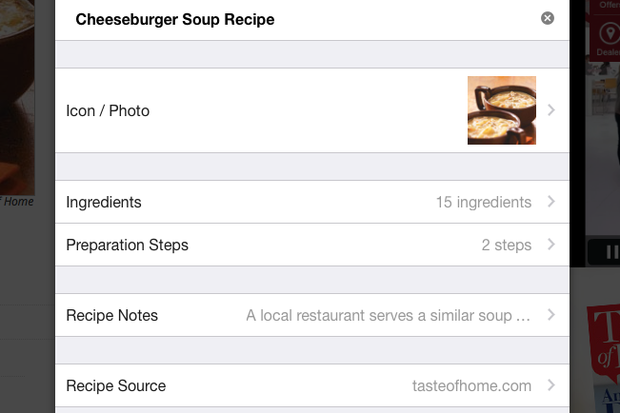 This feature worked like a charm on SkinnyTaste, The Cozy Apron, Allrecipes, and countless others, breaking down a list of ingredients and preparation steps with a photo of the completed dish. On rare occasions where websites weren’t formatted to microdata or hrecipe standards, it was a trivial matter to copy and paste data into the Mac app, which parses an entire block of text into individual steps. An annual paid subscription also adds native Mac and PC applications to the mix for planning shopping trips from the desktop. 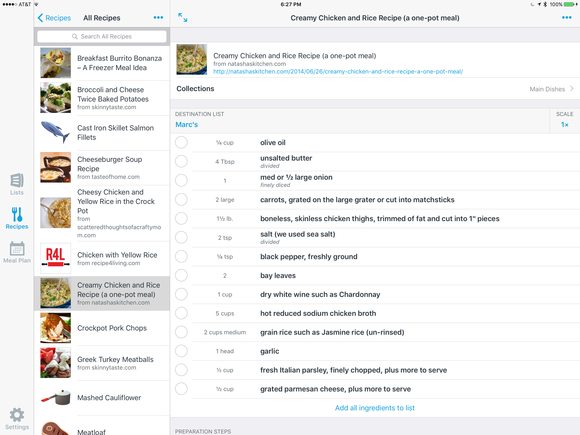 Paid members can also add photos to items, scale recipe ingredient quantities, assign stores to lists, personalize with premium themes, and organize lists into folders. There’s even an option to set up location-based reminders, which trigger when you’re near a favorite store, but it would nice if this worked only for lists with unpurchased items. Premium subscribers have the ability to add recipes with a click of the mouse using browser extensions for Safari, Chrome, and Firefox. 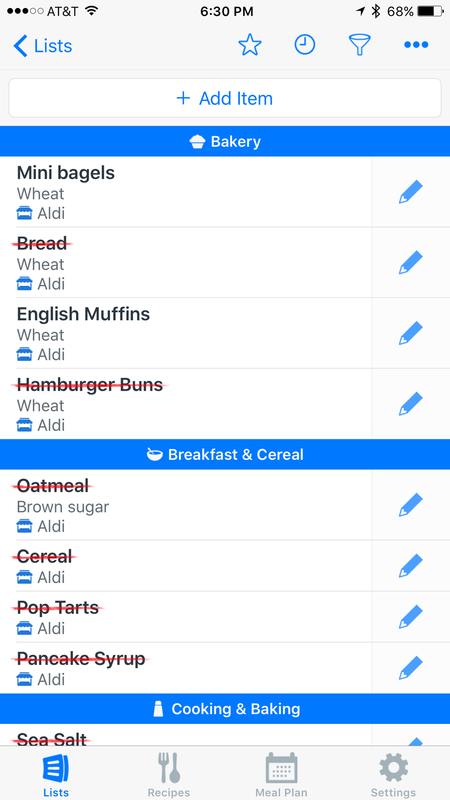 Although AnyList can be used to keep track of any kind of list, it’s best suited to grocery stores; I’d love to see more categories and common items from department and drug stores added to the mix. There’s also no companion Apple Watch app, which would make checking off items as they’re purchased even more convenient. AnyList checks off just about everything you could want in a grocery shopping app, but works best with a paid subscription. AnyList is a full-featured grocery shopping list and recipe organizer with lightning-fast cloud sync and cross-platform support.